Eventually, the king of Narnia, his unicorn Jewel, and two children from London are able to turn the tide. "Aslan's" stable is guarded at night by only one man, who is taken down by one of the children, Jill. Inside she finds Puzzle masquerading as Aslan…a "false Aslan" she calls him. Jill has pity on the donkey and leads Puzzle to meet up with the others. When the king learns what has been happening and that Puzzle has been the source of these troubles, he draws his sword to kill the donkey. Jill intervene's, protecting the donkey: "It wasn't his fault. It was all the Ape. He didn't know any better. And he's very sorry. He's a nice donkey." The donkey agreed, saying that he wasn't very smart, he only did what he was told, and that he didn't enjoy living like that. Soon, a group of dwarves lead by four wicked men approaches the group lead by King Tirian of Narnia. 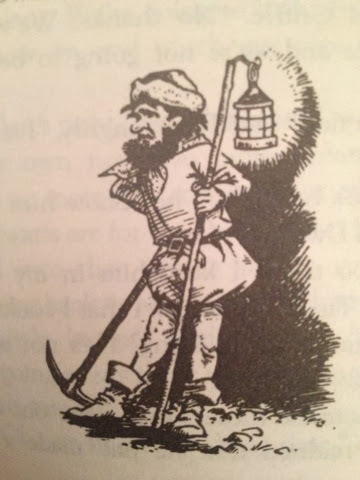 These dwarves had been deceived into believing that they needed to go work in the men's mines. "Aslan's orders, Aslan's orders. He sold us. What can we do against him?" say the dwarves. King Tirian then shows the dwarves Puzzle the Donkey, who was still wearing the lions coat, now disheveled and dirty. There is confusion, a fight breaks out, and the four men are killed. Afterwards the King proclaims: "Now, Dwarves, you are free….three cheers for Aslan!" But there is hardly a whisper from the dwarves. The group lead by the King cannot understand why the dwarves are not rejoicing at this news of freedom. Why didn't they respond with gladness when they learned that the Ape wasn't going to rule over them any longer and that everyone could go back to the way things were? One dwarf named Griffle steps forward and says "I feel I've heard about as much about Aslan as I want to for the rest of my life." The other dwarves mutter in agreement. Griffle continues "You must think we're blooming soft in the head…We've been taken in once and now you expect us to be be taken in again the next minute. We've no more use for stories about Aslan, see! Look at him [referring to Puzzle]! An old moke with long ears!" A back and forth ensues between the King and the dwarves. The King is stunned by their response, and retorts "Which one of us said that was Aslan? That is the Ape's imitation of the real Aslan. Can't you understand?" Griffle shoots back "And you've got a better imitation, I suppose. No thanks, we've been fooled once and we're not going to be fooled again." "I serve the real Aslan" shouts the King. "Where's he? Who's he? Show him to us!" reply several dwarves. The King shoots back "Do you think I keep him in my wallet? Who am I that I could make Aslan appear at my bidding? He's not a tame lion." Uh-oh…the dwarves had heard that line before. Those words were used by Shift to trick them into doing things that the Dwarves originally believed Aslan would never ask them to do. "He's not a tame lion, he's not a tame lion" they muttered and sneered. Jill passionately testifies that she has seen the real Aslan. "So you say. They've taught you your stuff all right. Saying your lessons, ain't you?" replies Griffle. He continues "I don't think we want anymore kings -- no more than we want any Aslans. We're going to look after ourselves from now on and touch our caps to nobody." The other dwarves chime in "We're on our own now. No more Aslan, no more kings, no more silly stories about other worlds. The Dwarves are for the Dwarves!" You see, by being deceived, the dwarves had lost faith in the real Aslan. They were so hurt, ashamed of what had become of them, what they had been lead to believe and do, that it changed them. It broke their little dwarf hearts. They lost hope and from thenceforth would only believe what was before their eyes and what their hands could touch. One of the results of Shift setting up a false Aslan was that it stopped people from believing in the real Aslan. The king thought the dwarves would immediately rally to his side after exposing the deception, but that was not the case. When one realizes that they have been deceived, it is very hard to have faith in the truth or to know what the truth is anymore. Why would God allow me to be deceived? What if I am deceived again? How can I trust anything? Is God mad at me for being deceived? How can God ever trust me again? Where did I miss the clues along the path to deception? Did God try to intervene and I missed it? I was trying to believe, and do right, but my faith was amiss. What about all those signs that followed my faith? Doesn't God care? Why wouldn't He come to stop the deception that was underway and the horrible things being done in His name? Will He be merciful to the deceived? Sadly, the most of the dwarves fight against both the sides of good and evil in the last battle. At one point the wicked men throw the dwarves into the stable where Puzzle once was. This place is now known as the "shrine of Tash" and various animals and people are thrown in to be killed. However, there was only a wicked man stationed inside with orders to kill anyone who came in that those in charge outside were against. This guard was killed by another man who entered the shrine willingly, more on him later. Those who entered the stable saw and experienced what they merited in this life. All the dwarves see is the dirty and dark stable. Other who have entered saw beautiful countryside, sunshine, and mountains. The real Aslan comes to the dwarves, but they cannot see Him…He purrs in their ears, but they cannot hear Him, thinking it is some noise coming from the other side of the stable…He gives them a feast to eat and a goblet of wine placed in their right hands, but all they tasted was straw and water from the stable bucket. They are blinded, forever. Aslan says "They will not let us help them. They have chosen cunning instead of belief. Their prison is only in their own minds, yet they are in that prison; and so afraid to be taken in that they cannot be taken out." A form of spirit prison, unbelief. It is difficult to judge, and that's not our role anyway, for at the judgment itself, one of these dwarves, who was even among those who shot arrows and killed the great horses was welcomed on the right side of Aslan while others went to the left. There are also people who end up rejecting everything when they come to no longer believe one or two pieces of the larger picture. For example, some lose their testimony of the Book of Mormon or Joseph Smith or the priesthood, but then throw out everything, including their belief in Christ and Father in Heaven. This is the adversary's fondest hope…tarnish or crack one little facet and the whole diamond is flawed. Deceit can be devastating. “...nothing is a greater injury to the children of men than to be under the influence of a false spirit when they think they have the Spirit of God” (Joseph Smith, HC 4:573). Don't give up! Continue to persist in faith and hope! The darkness always comes before the light! Hang on! It's part of the process, part of the path! Have belief!